On our summer road trip, we stopped to visit friends in Wisconsin. It turns out they live only a few minutes from Wisconsin Dells, or The Dells as its known colloquially. I never knew of such a place existed, but here it is. Despite the heat of summer, it was cool and dark in this mini canyon, so I balanced the camera on the wooden railing to get a longer exposure. 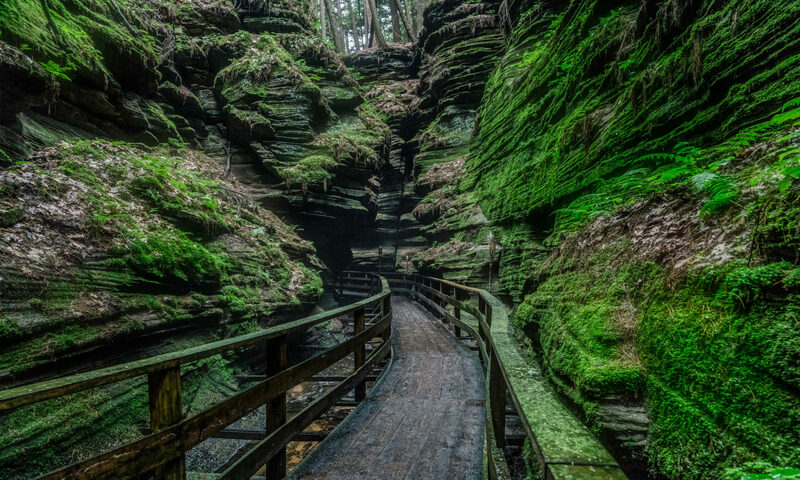 The Dells are sandstone gorge formed by glaciers. There are tributaries like this that run into the river. Below the boardwalk ran a cool creek that ended at the river. This walkway strategically ends up in a snack bar about a quarter mile up from the river. Nevertheless, the photo opportunities are endless. In some sense, the area reminds me a little of Niagra Falls where there is a natural wonder that spawned a local tourism industry. There are indoor (for the winters), and outdoor water parks, wax museums, and lumberjack shows every hour. It bills itself as the water park capital of the world. Who knew? But for me, by far the best experience was taking a boat up the Wisconsin River to see the Dells.